The PlayStation 4 has been getting nothing but good press since it's showing at E3 this year, but this is a scandal I don't think Sony wants anything to do with. Several Chinese students have stepped forward and alleged that they have been forced to build PlayStation 4's for an internship at Foxconn's factory in Yantai. Over 1,000 students from the Xi'an Institute of Technology were told that they must complete the internship or their diplomas would be withheld. Dropping out of the internship early would not give the students the six credits needed to graduate. The students have been paid normal wages, at 1,600 yuan, or $261 a month, and several are claiming that they were forced to work overtime and night shifts, sometimes of up to eleven hours a day, which violates Foxconn's policies. "Immediate actions have been taken to bring that campus into full compliance with our code and policies by reinforcing the policies of no overtime and no night shifts for student interns, even though such work is voluntary, and reminding all interns of their rights to terminate their participation in the program at any time." The statement also claimed that it provided students "with the opportunity to gain practical work experience and on-the-job training that will support their efforts to find employment following their graduation." Students have claimed they were forced to do remedial tasks like placing manuals and cables into boxes, removing protective films, and putting stickers on the machines. Not exactly the type of work graduates from a technical college are looking for, but I suppose there is no graduation if they "terminate their participation." 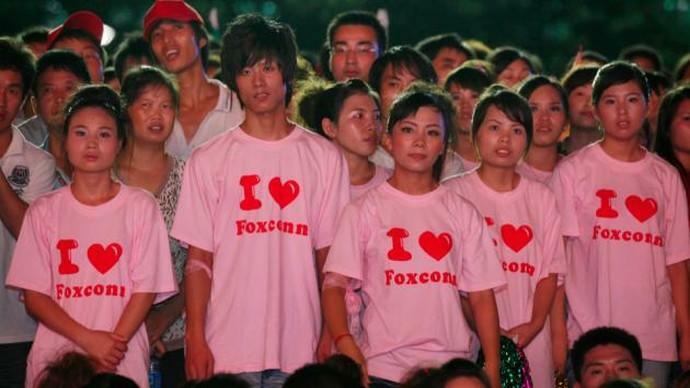 Then, maybe Foxconn would love to hire them as full-time employees, and they don't even need training. Sony has also issued a statement through CVG, believing that Foxconn remains in compliance of the Sony Supplier Code of Conduct. The Sony Group established the Sony Supplier Code of Conduct in June 2005 with the expectation of every supplier agreeing and adhering to the policies of the Sony Group in complying with all applicable laws, work ethics, labour conditions, and respect for human rights, environmental conservation and health & safety. We understand Foxconn fully comprehend and comply with this Sony Supplier Code of Conduct. Let it not go unsaid that this was the same factory which was caught using underage workers to produce the Wii U. Sometimes companies just never learn, do they?